The single most frequent complication of ureteral stenting is occlusion of the stent due to encrustation, which is an unpredictable phenomenon but which appears to correlate with the length of time that a stent has been left in place. About 68% of stents that are indwelling for nine weeks have been found to be obstructed with mucus and microcalculi when they are removed (115,116). In another series, El-Faqih et al. (117) found that in patients in whom stents were placed for treatment of urinary stones, there was minimal morbidity when the indwelling time was six weeks or less. Encrustation was present in 9.2% of stents retrieved before six weeks, but in 47.5% of stents retrieved at 6 to 12 weeks, and in 76.3% of stents retrieved after 12 weeks. In order to minimize the risk of early encrustation, many investigators suggest that all patients should be encouraged to maintain a high fluid intake after stent placement to dilute the urine and that urine infections should be aggressively treated. Evaluation to confirm stent patency and function can sometimes be difficult. Flank pain may occur with both functioning and nonfunctioning stents and is not a helpful clinical parameter to monitor stent function. Many, though not all, patent stents will reflux on voiding cystourethrography. Diuretic renography is reportedly the most sensitive test in evaluating stent patency (118). Pyelocaliectasis often persists even after relief of obstruction with a ureteral stent, and the upper urinary tract may remain abnormal in appearance. Thus, imaging may be unhelpful in predicting which patients have obstructed stents. Intrarenal Doppler sonography can be used to distinguish between patency and obstruction. Platt et al. (119) reported that obstructed stents were associated with increased mean resistive indices (0.78), whereas patent stents were associated with a resistive index of less than 0.70. Assessment of jets in the urinary bladder with color Doppler ultrasonography has also been used (120) to evaluate stent patency. Stents should be changed every three to six months, whether cystoscopically by urologists or in a retrograde (per urethral) fashion by radiologists. The physician placing the stent bears the responsibility of making the patient aware of the necessity of follow-up and monitoring. Patients who present with fractured stents (Fig. 6A,B) will often report that they were either unaware of the presence of an indwelling stent or unaware that periodic exchange or removal was necessary. Severe encrustation on indwelling ureteral stents tends to be at the renal or bladder ends, and this propensity has been attributed to ureteral peristalsis "wiping" clean the ureteral portion of the stent (Fig. 7A,B) (121). A "twinkling" artifact may be seen in encrusted stents on color Doppler sonography (122). Minimally encrusted stents may be removed without event, but more severe encrustation can be complicated to treat and often requires ESWL in combination with endoscopic techniques (Fig. 7A-D) (123-126). (128). Distal migration is more common than proximal migration and may be a result of inappropriate positioning. Stents that are fractured are best approached with a combined percutaneous-endoscopic technique. Although the stent fragments can be removed percutaneously, the fragments tend to be brittle and refracture into smaller pieces when they are grasped with forceps or baskets. Therefore, removal under endoscopic guidance is most likely to result in complete extraction (Fig. 6) (129). Figure 6 A patient with ureteral stents placed for bilateral ureteral obstruction (same patient as in Fig. 5) presenting two years later with nonspecific urinary complaints. The patient was lost to follow-up after ureteral stent placement. (A) Plain film demonstrates fractures of the stents bilaterally. This is not a common complication with modern day stents. 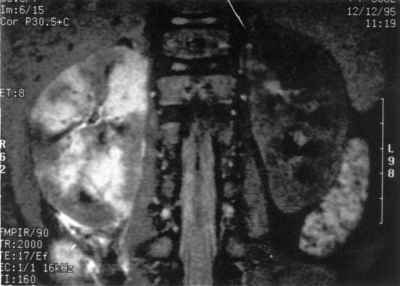 (B) An IVU showing bilateral moderate hydronephrosis. Note the stent fragment in the urethra. Abbreviation: IVU, intravenous urogram. 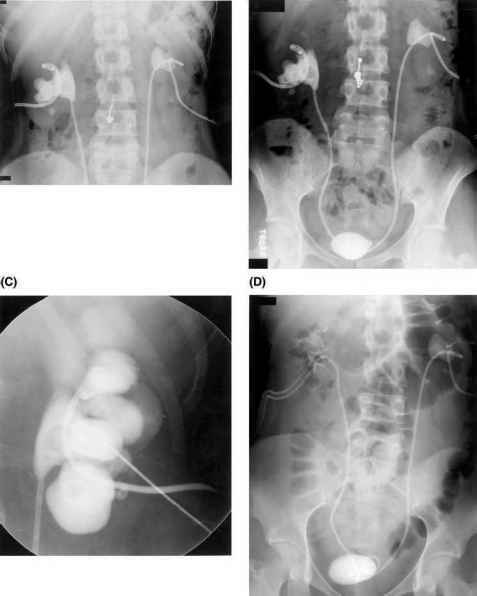 Figure 7 A patient with severely encrusted ureteral stents. (A,B) Plain abdominal films demonstrate large calculi that have encrusted on the proximal and distal pigtails of the catheters. The patient has an internalized stent and an externally draining nephrostomy on the right, and a nephroureteral stent on the left. Note the encrustation on the ureteral limb of the right catheter at the L5 level. (C) The right kidney was treated first. A new nephrostomy was performed (with patient in prone position) through an interpolar calyx for removal of encrusted stone. The majority of the stone in the right collecting system is obscured by the contrast injected into the right collecting system. (D) A follow-up film shows only small residual calculi in the right kidney. The encrustations on the ureteral portion of the stent were treated with SWL and the bladder calculus removed by open surgery. Abbreviation: SWL, shock wave lithotripsy. predisposing factor is compromise of the vascular supply of the ureter, with a fistula occurring where the ureter crosses the iliac artery. Underlying abnormalities of the iliac artery, such as an aneurysm, are additional risk factors. Unsuspected and undiagnosed ureteroarterial fistulas are associated with 52% mortality, whereas a correct preoperative diagnosis allows for 89% of patients to be successfully discharged from the hospital (133). Prompt diagnosis requires an awareness of the condition and referral for selective or subselective arterial injections that may need to be performed in multiple projections. Provocative maneuvers, such as stent removal or manipulation during angiography, may be required during angiography for demonstration of the fistula, particularly if the angiogram is being performed in a quiescent period, when no acute bleeding is occurring. An indwelling stent can be associated with discomfort in the flank or the pelvis, which can range from severe pain to a mild annoyance. A long intravesical segment can cause significant dysuria and bladder spasms due to irritation of the trigone and may necessitate removal of the stent, but even an appropriately placed stent may cause irritative bladder symptoms. Most patients can be managed with antispasmodics and hydration. Flank pain may be worse during voiding, but some patients complain of flank discomfort even in the nonvoiding state. Intolerance to ureteral stents is neither material-specific nor design-specific. Pryor et al. (134) found no significant differences in patient symptoms in an analysis of stents made of polyurethane, sili-cone, Silitek, and C-Flex. If there are significant symptoms, an abdominal radiograph is often helpful in assuring that the stent remains well positioned. Stents are associated with microscopic hematuria in the majority of patients, but gross hematuria and pyuria may also occur (albeit less frequently). How often should films be obtained after a ureteral stent placement?